Ask fellow campers about "Ponderosa State Park" and nearby attractions. Question: Hey campers! Can anyone tell me what a "companion" site is at Ponderosa State Park? Could we fit 2 trailers and would there be hookups for both, or just one set of hookups? Answer: A "companion" site accomodates two trailers or camping rigs. There are two sets of hookups and two picnic tables. It also requires double the fee of a single campsite. You cannot camp at a "companion" site without paying a double fee even if their is only one camping unit. This type of site is generally used by family or friends who want to camp together. This is a very popular park. We were lucky to get a reservation when we booked in February. There were lots of empty sites mid-week but completely full on weekends. This was the challange since we wanted to stay for 7 days. The site we got, 92 in Chokecherry Lane, was quite spacious with lots of room in front and a tent pad behind. My only complaint was a popular bike path right at our site limiting any privacy. Since we use our bicycles a often, it was at least handy to get around. Our site was the only one that close to the path. In the Peninsula Campground, to my understanding, there are no sewer hook-ups, just power and water. For a 7-day stay, this would have been nice. The "RV" Campground has full hook-ups and caters more to the bigger rigs. Access to the lake was a 5 minute walk or a 10 minute bike ride if you want less crowds. The town of McCall was delightful with lots of ammenities. It took us 15 minutes to bike into town. 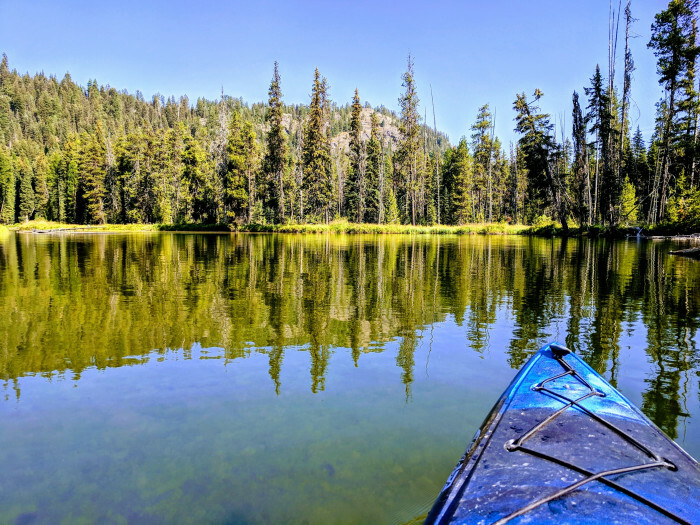 If you want to go kayaking, a definite must is the north end of Payette Lake. There are rentals there but make sure you reserve. It's very popular! We camped at Ponderosa State Park in a Travel Trailer. Wonderful park in the heart of McCall. Something for everyone. Spacious sites. Nice beaches. Scenic views of Payette Lake. 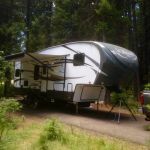 We camped at Ponderosa State Park in a Fifth Wheel. Take the scenic drive to Osprey Point. You won't be disappointed. This is a fantastic state park. They have limited full hook ups and are reservable. We try to get here at least 4 times a year. 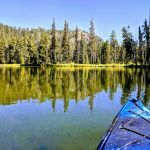 Right on Payette Lake with beautifully treed sites and many walking/running/hiking trails. The sites in Dogwood are spacious with trees around, fire pit, and picnic table. There is a tent area with most sites and some group sites. The bathrooms are always clean, but we have not used the showers. We camped at Ponderosa State Park in a Fifth Wheel. McCall is a cute little town with everything one needs including a good sized market and restaurants. There are several loops in this beautiful state park. Some loops have smaller campsites, the sites are wooded, and are better suited for tents and smaller RVs since the roads in these loops are tight and winding. The campsites in these loops have water and electric, but no sewer. There is a dump station available. The Dogwood and Elderberry loops are better suited for larger rigs. These two loops offer both back-in and pull-through sites, with full hookups (50 amp). If you're not familiar with the campground, the Dogwood and Elderberry loops are in the "group" campground, but the campground is not for groups only. The park is full of ponderosa and other pines, and there is a beautiful lake where one can swim or lounge on the sand. Interior roads and sites are asphalt. The sites are nicely spaced with a picnic table and fire ring. There are numerous hiking/biking trails around the park, as well as picnic tables near the lake. Verizon data and cell service worked well. This is a perfect state park and we would stay again if passing through the area. We camped at Ponderosa State Park in a Motorhome. All services available in McCall. Our first time here, and it was a weekend; the campground was packed - and no wonder. This park is just beautiful! Huge ponderosa and other pines, some undergrowth, and sites are large and placed well, especially the back-ins, among all of these. A family of deer hung out in/near our loop and we saw them daily. The surprise: many campers left midday Sunday, and within an hour or two, all their sites were filled once again! Reservations highly recommended. Sites with hookups have both electric and water; there are some full-hookup sites in a separate loop farther from the lake, but still well shaded. Bathhouses are newer, kept very clean by campground hosts; showers clean and effective. This is a perfect park for bicycles, with lots of beautiful bike trails. We definitely want to come again. We camped at Ponderosa State Park in a Travel Trailer. Lots to do in town - shopping, etc., as it's a very tourist-oriented town. The lake offers boating, swimming and fishing, and all 3 can be done from the state park. Hiking & biking very big here too. Some quite nice rental cabins available near the visitor center. The option isn't offered on the form here to note that our site was paved (asphalt). This is a beautiful state park. The full hook up sites are all paved and nicely maintained. There is an onsite camp host to help if you need anything. The office was open until early evening. The setting is very beautiful and peaceful on Payette Lake. There were many hiking trails. Some bike paths are paved while others are gravel. It is very close to town for shopping and restaurants. We camped at Ponderosa State Park in a Fifth Wheel. Less than three miles from McCall. Beautiful state park with good sites for large RVs. Our Verizon MiFi worked well, even without a booster antenna. Great walking trails in the park and the lake is absolutely beautiful. Spacious sites, a beautiful lake, a town close by that had everything we needed for an enjoyable stay. We would definitely stay here again when passing through this area. We camped at Ponderosa State Park in a Fifth Wheel. Excellent state park with lots of things to see and do. We stayed in the Dogwood loop in a pull-through with electric, water, and sewer hook up. The site was paved and level with ample space between neighbors. A sandy area with fire pit is next to each site. Wi-Fi was marginal and did not work at all one night. AT&T cell service was non-existent except in McCall, then weak 3G most of the time. Too many trees for satellite, but with so much to see and do we did not miss the electronics. Restaurants, groceries and gas were available in McCall. Kayaking, hiking, biking was all great fun. We stayed 7 nights and would stay again. We camped at Ponderosa State Park in a Travel Trailer. 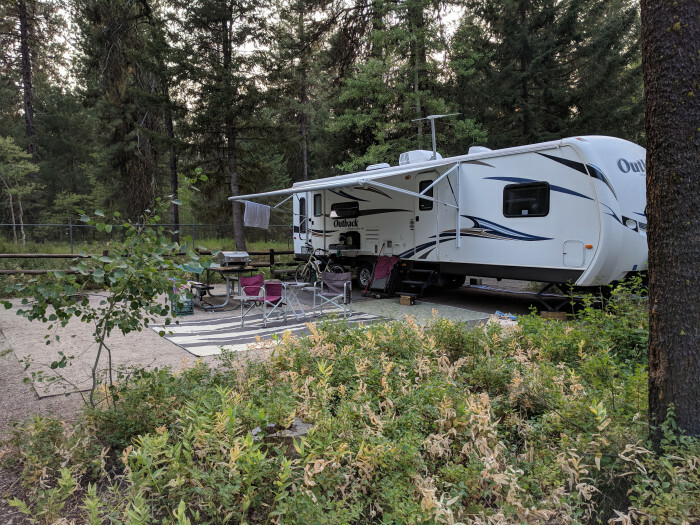 A very nice campground with ample spacing between sites. We have stayed in this state park numerous times and will continue to do so. Our site was hard surfaced and level. Utilities worked as they should and we had no problems. The campground was quiet and well maintained in spite of the state trying to cut every program to the bone. The Wi-Fi is a contract and if you want more than 20 minutes a day you are going to have to pay a fee for additional time. Three of the loops have water and electricity but no sewer but do offer a dump station. The other two loops offer full hookups. We camped at Ponderosa State Park in a Travel Trailer. 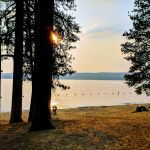 We live a little over two hours from McCall and have been camping at Ponderosa State Park for over 20 years. This is an extremely well-kept park that now includes five camping loops and 163 serviced campsites. The original three (Aspen, Blackberry and Chokecherry) offer water and electricity with a dump station along with restrooms and showers. The two newest loops (Dogwood and Elderberry) offer sewer connections at every site and several paved pull through pads and a large shelter area in each loop. You'll find an area with bathrooms and community showers. 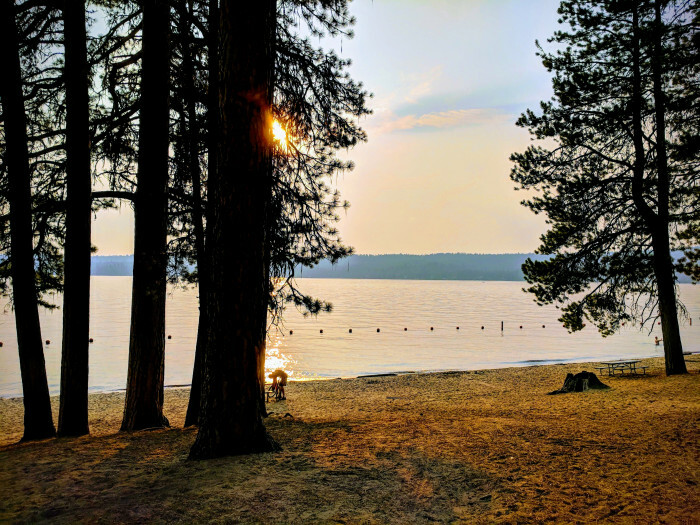 The park is situated around Payette Lake and campers can easily walk from any site to the lake. Ponderosa is gorgeous and located close to McCall which is a beautiful Idaho town. You won't regret spending time there. We camped at Ponderosa State Park in a Travel Trailer. As several other reviewers have said this is an excellent state park campground. The sites are well separated and clean. Our sites were very close to level and paved. We were in one of the companion sites which accounts for the slightly higher fee. If you have an Idaho RV or Idaho State Parks Pass make your reservations online for applicable discounts as the Reserve America site does not allow you to claim the discounts available. WiFi was good at our site. It is provided by a commercial service and you only get 20 min every 12 hours free, after that you have to pay. It is very easy to get into McCall, but not extremely bike friendly. The park offers a lot of good family biking and you can walk to the lake. Most sites are at least partly shaded. We will stay here again. We camped at Ponderosa State Park in a Travel Trailer. Great state park and would stay again. Lots of room to move around, and close to town. All sites have ample grassy area and are overall very quiet. We were able to walk to lake play area or drive up the peninsula for a more isolated location. We camped at Ponderosa State Park in a Fifth Wheel. This is a great state park. Stayed in the newer section (Dogwood Loop) with full hookups and 50 amps electricity. Spacious sites, mostly shaded with lots of room between units. Very nice pull through sites and long back in sites. Bathrooms new and well maintained. Excellent biking and walking/hiking trails. Numerous beaches on clean, scenic Payette lake. Close to downtown for nice restaurants and shops. We'll definitely come here again. 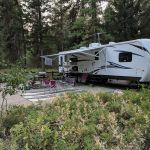 We camped at Ponderosa State Park in a Fifth Wheel. Lots to do in town - shopping, etc., as it's a very tourist-oriented town. The lake offers boating, swimming and fishing, and all 3 can be done from the state park. Hiking & biking very big here too. Some quite nice rental cabins available near the visitor center. The option isn't offered on the form here to note that our site was paved (asphalt). Are you affiliated with Ponderosa State Park ?